The West Highland Way was the first official long-distance footpath in Scotland. The idea was conceived in the 1960s at the height of enthusiasm brought about by the opening of the Pennine Way in England. It was a massive task to create such an ambitious right of way, requiring investigation of the best route, endless liaising between the various local authorities and the Countryside Commission for Scotland, negotiations with landowners through whose land the Way might pass and then finally, when all was agreed, the construction of the path itself. This may seem simple, yet a flagship route such as the West Highland Way required information boards, waymarks, sturdy bridges and stiles, and adequate surfacing and drainage to cope with the high numbers of walkers it would inevitably attract. As a result it took until 1980 for the Way finally to be declared open. In September 2010 the end point of the Way was moved from the roundabout on the A82 to the centre of Fort William, thereby adding one mile to the total route. A bronze sculpture of a seated weary-looking walker marks the spot. No great level of experience is needed to walk the West Highland Way as the whole trail is on obvious, well-maintained paths with excellent waymarks where needed. The first half of the route, south of Tyndrum, is across gentle terrain generally sticking to the bottom of valleys or traversing their sides. Only on a couple of occasions does the trail rise to just over 300m (1000ft) and on the first and hardest instance, the crossing of Conic Hill, this mildly strenuous section can be avoided. On this half you are never far from help and there’s plenty of shelter should the weather turn foul. North of Tyndrum the terrain becomes a little more challenging. With fewer settlements it can even feel quite remote. The trail crosses some high, desolate country: Rannoch Moor (445m/1460ft), the Devil’s Staircase (548m/1797ft) and the Lairigmor (330m/1082ft), all of which can be exposed in bad weather. 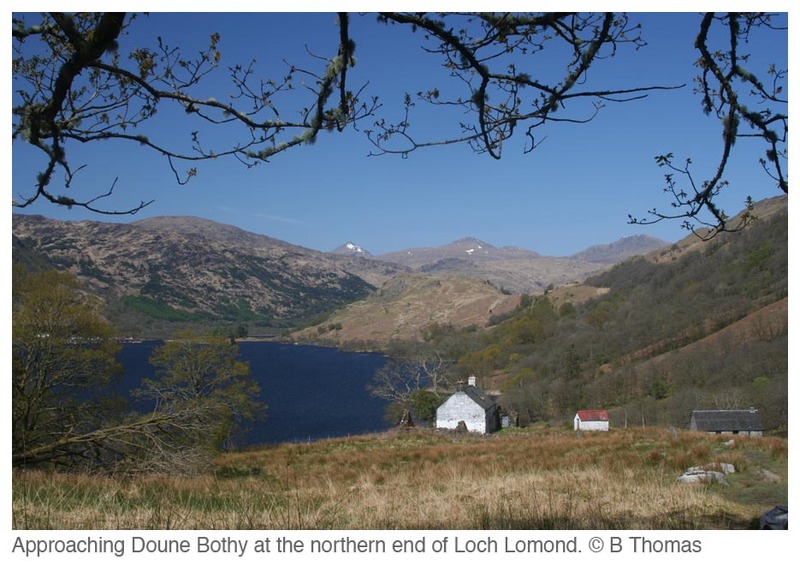 Crossing these magnificent parts gives you a true taste of Highland Scotland and you will require basic outdoor competence to do so safely (see pp55-60 for further advice).